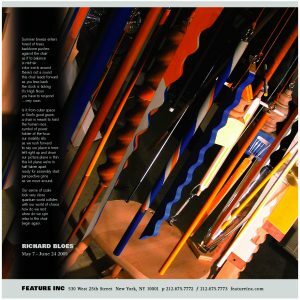 RICHARD BLOES’s objects generally appear as loosely assembled elements from store-bought self- assembly kits, wood shop scraps, and found performance props that are anachronistically punctuated with the hard edge and movement of a video. In actuality the objects are highly organized sequences of things and stuff that are manipulated by friends and family according to a script by the artist, who documents the action in real time on video. From Envoy Enterprises web site. Landside, shot of the crew. 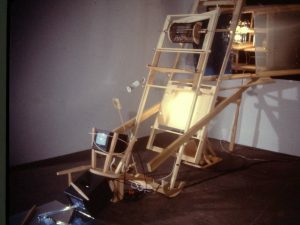 Richard Bloes’s videotapes and video installations are conceptualized as low-tech, hand-made mechanical approximations (and deconstructions) of the ideas and functions of technology and science. 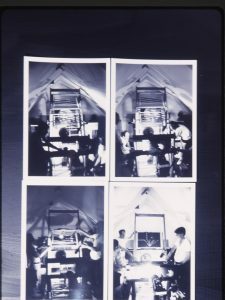 His earliest works explored the possibilities of designing simple mechanical structures, made of wood and paint, which would mimic visual effects specific to the electronic video medium: a painted panel sliding across the screen would approximate the electronic “wipe”; a structure painted in different colors would spin rapidly to suggest the distortions of colorized and electronically altered video images. 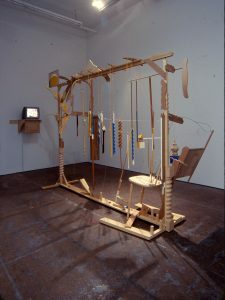 These “mechanical” effects are then recorded on video, while the structure itself, which resembles a piece of large handcrafted, wooden machinery, is preserved as a kind of sculpture, whose form develops out of its function, and whose function is demonstrated by the accompanying videotape. Recent works have become increasingly decorative and often incorporate objects – such as carpentry tools, tooled pieces of wood, and portions of prefabricated kits – which make reference to the process of their own construction through an increasingly elaborated artisanship. In recent years Bloes has expanded this basic approach into a full-fledged artistic idiom, which he has used to explore various scientific and technological phenomena in a series of different works. 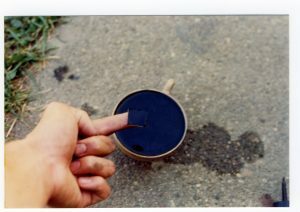 It is useful to think of Bloes’s video installations as homegrown experiments designed to examine the relationships between science and aesthetics. 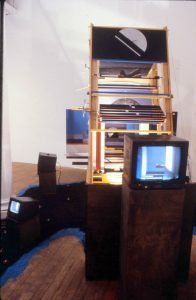 Sophisticated concepts like the study of astronomy (Night Space, 1999) or the concept of time (Time Spans, 1990) are “duplicated” or reworked through a “primitive” methodology of hand-made mechanical construction and approximation. 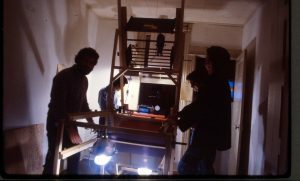 In the process, these “experiments” become transformed into mysteriously abstract videotapes and beautifully crafted sculptural objects, which seem to have blossomed mysteriously out of the rather abstract concepts they began with. Bloes’s installations are like aesthetic bridges spanning the imaginary gap between the everyday reality of the artist’s life and the abstractions of physics and the other sciences. These works propose solutions to scientific questions, and suggest that, from the perspective of the artist/artisan, craftsmanship and art are tools equal to those of scientific sophistication and achievement. Richard Bloes (b. 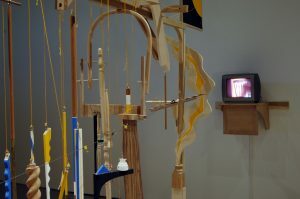 1951) is an Intermedia artist working with combinations of sculpture, found objects, installation and video. 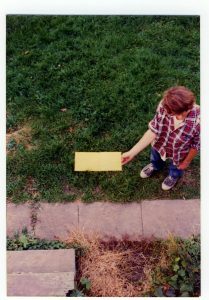 He received his MFA in Intermedia and Video Art from the University of Iowa in 1977. His large-scale sculptural works involves the incorporation of video elements animating the sculptural elements of the work itself. 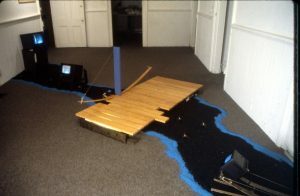 The process of the making of the recordings are both seen in the resulting video and imagined by the viewer, comparing the video to the corresponding elements in the sculpture, which is still. Its stillness would become that of the past, but it has something to say, to add, to the video, as the camera’s range is necessarily always somewhat narrow. There are more objects and processes outside of the camera’s range and the viewer has to imagine, animate that space, which gives a greater breadth to the video in return. His work has been exhibited in numerous group and solo shows including: Feature Gallery, NY; Wexner Center for the Arts, Columbus, OH; American Museum of the Moving Image, Astoria, NY; P.S. 1 Contemporary Art Center, Long Island, NY; Contemporary Art Center, Cincinnati, OH; Sculpture Center, NY; Ronald Feldman Fine Arts, NY; Intermedia Arts Minnesota, MN; Metropolitan Museum of Art, New York; Brooklyn Museum of Art, NY; New Museum of Contemporary Art, NY; and The Kitchen, NY. He has received a Guggenheim Fellowship, and National Endowment for the Arts New Genres Fellowship, and a Pollock-Krasner Foundation Grant. Bloes lives and works in New York and it represented by Feature Gallery, NY.